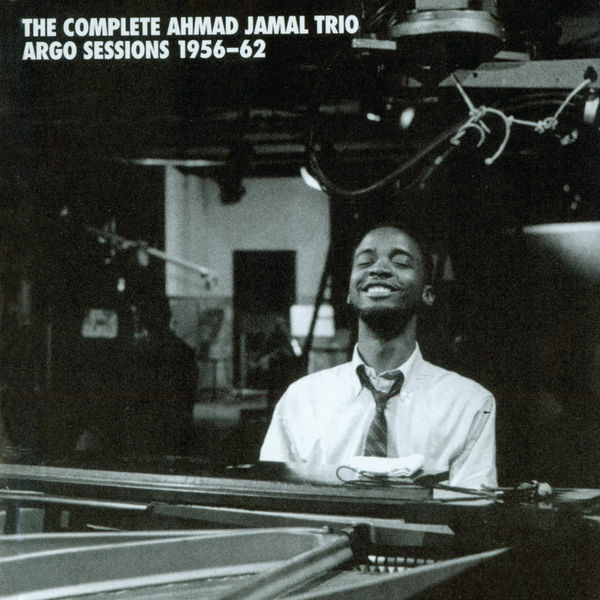 Ahmad Jamal, Piano, AssociatedPerformer, ComposerLyricist - Israel Crosby, Double Bass, AssociatedPerformer - Walter Perkins, Drums, AssociatedPerformer - Ahmad Jamal Trio, MainArtist - Phil Chess, Producer Copyright : ℗ 1956 Verve Label Group, a Division of UMG Recordings, Inc.
Ned Washington, ComposerLyricist - Bronislaw Kaper, ComposerLyricist - Ahmad Jamal, Piano, AssociatedPerformer - Israel Crosby, Double Bass, AssociatedPerformer - Walter Perkins, Drums, AssociatedPerformer - Ahmad Jamal Trio, MainArtist - Phil Chess, Producer Copyright : ℗ 1956 Verve Label Group, a Division of UMG Recordings, Inc.
Ahmad Jamal, Piano, AssociatedPerformer - R. Freed, ComposerLyricist - Israel Crosby, Double Bass, AssociatedPerformer - Walter Perkins, Drums, AssociatedPerformer - Ahmad Jamal Trio, MainArtist - B Lane, ComposerLyricist - Phil Chess, Producer Copyright : ℗ 1956 Verve Label Group, a Division of UMG Recordings, Inc.
N. Robinson, ComposerLyricist - Ahmad Jamal, Piano, AssociatedPerformer - Israel Crosby, Double Bass, AssociatedPerformer - Walter Perkins, Drums, AssociatedPerformer - Ahmad Jamal Trio, MainArtist - Phil Chess, Producer Copyright : ℗ 1956 Verve Label Group, a Division of UMG Recordings, Inc.
FRANK LOESSER, ComposerLyricist - Ahmad Jamal, Piano, AssociatedPerformer - Israel Crosby, Double Bass, AssociatedPerformer - Walter Perkins, Drums, AssociatedPerformer - Ahmad Jamal Trio, MainArtist - Phil Chess, Producer Copyright : ℗ 1956 Verve Label Group, a Division of UMG Recordings, Inc.
Richard Rodgers, ComposerLyricist - Lorenz Hart, ComposerLyricist - Ahmad Jamal, Piano, AssociatedPerformer - Israel Crosby, Double Bass, AssociatedPerformer - Walter Perkins, Drums, AssociatedPerformer - Ahmad Jamal Trio, MainArtist - Phil Chess, Producer Copyright : ℗ 1956 Verve Label Group, a Division of UMG Recordings, Inc.
George Gershwin, ComposerLyricist - Ira Gershwin, ComposerLyricist - Ahmad Jamal, MainArtist - Israel Crosby, Participant - Vernell Fournier, Participant - Dave Usher, Producer Copyright : ℗ 1958 The Verve Music Group, a Division of UMG Recordings, Inc.
Richard Rodgers, Composer - Oscar Hammerstein II , Author - Ahmad Jamal, MainArtist - Israel Crosby, Participant - Vernell Fournier, Participant - Dave Usher, Producer Copyright : ℗ 1958 The Verve Music Group, a Division of UMG Recordings, Inc.
Karl Suessdorf, ComposerLyricist - Blackburn, ComposerLyricist - Ahmad Jamal, MainArtist - Israel Crosby, Participant - Vernell Fournier, Participant - John M. Blackburn, ComposerLyricist - Dave Usher, Producer Copyright : ℗ 1958 The Verve Music Group, a Division of UMG Recordings, Inc.
Stephen Weiss, ComposerLyricist - Bernie Baum, ComposerLyricist - Ahmad Jamal, MainArtist - Israel Crosby, Participant - Vernell Fournier, Participant - Dave Usher, Producer Copyright : ℗ 1958 The Verve Music Group, a Division of UMG Recordings, Inc.
Ahmad Jamal, MainArtist - Buddy Bernier, ComposerLyricist - Nat Simon, ComposerLyricist - Israel Crosby, Participant - Vernell Fournier, Participant - Dave Usher, Producer Copyright : ℗ 1958 The Verve Music Group, a Division of UMG Recordings, Inc.
Dizzy Gillespie, Composer - Ahmad Jamal, MainArtist - Israel Crosby, Participant - Vernell Fournier, Participant - Dave Usher, Producer Copyright : ℗ 1958 The Verve Music Group, a Division of UMG Recordings, Inc.
Robert Haggart, Composer - Johnny Burke, Author - Ahmad Jamal, MainArtist - Phil Chess, Producer Copyright : ℗ 1958 The Verve Music Group, a Division of UMG Recordings, Inc.
Alan Jay Lerner, Composer - Burton Lane, Composer - Ahmad Jamal Trio, MainArtist - Dave Usher, Producer Copyright : ℗ 1958 Verve Label Group, a Division of UMG Recordings, Inc.
Jerome Kern, Composer - Oscar Hammerstein II , Author - Ahmad Jamal Trio, MainArtist - Dave Usher, Producer Copyright : ℗ 1958 Verve Label Group, a Division of UMG Recordings, Inc.
Ray Noble, ComposerLyricist - Ahmad Jamal Trio, MainArtist - Dave Usher, Producer Copyright : ℗ 1958 Verve Label Group, a Division of UMG Recordings, Inc.
Richard Rodgers, Composer - Oscar Hammerstein II , Author - Ahmad Jamal Trio, MainArtist - Dave Usher, Producer Copyright : ℗ 1958 Verve Label Group, a Division of UMG Recordings, Inc.
Gene DePaul, Composer - Don Raye, Author - Patricia Johnston, Composer - Ahmad Jamal Trio, MainArtist - Dave Usher, Producer Copyright : ℗ 1958 Verve Label Group, a Division of UMG Recordings, Inc.
Richard Rodgers, ComposerLyricist - Lorenz Hart, ComposerLyricist - Ahmad Jamal Trio, MainArtist - Dave Usher, Producer Copyright : ℗ 1958 Verve Label Group, a Division of UMG Recordings, Inc.
Herbert Magidson, Composer - Allie Wrubel, Author - Ahmad Jamal Trio, MainArtist - Dave Usher, Producer Copyright : ℗ 1958 Verve Label Group, a Division of UMG Recordings, Inc.
Jamal, ComposerLyricist - Ahmad Jamal Trio, MainArtist - Dave Usher, Producer Copyright : ℗ 1958 Verve Label Group, a Division of UMG Recordings, Inc.
Jule Styne, Composer - Sammy Cahn, Author - Ahmad Jamal Trio, MainArtist - Dave Usher, Producer Copyright : ℗ 1958 Verve Label Group, a Division of UMG Recordings, Inc.
John Golden, ComposerLyricist - Raymond Hubbell, ComposerLyricist - Ahmad Jamal Trio, MainArtist - Dave Usher, Producer Copyright : ℗ 1958 Verve Label Group, a Division of UMG Recordings, Inc.
Al Stillman, Author - Sidney King Russell, Author - Margarita Lecuona, Composer - Ahmad Jamal Trio, MainArtist - Dave Usher, Producer Copyright : ℗ 1958 Verve Label Group, a Division of UMG Recordings, Inc.
ARTHUR FREED, Author - NACIO HERB BROWN, Composer - Ahmad Jamal Trio, MainArtist - Dave Usher, Producer Copyright : ℗ 1958 Verve Label Group, a Division of UMG Recordings, Inc.
Benny Goodman, Composer - Edgar Sampson, Composer - Chick William Webb, Composer - Ahmad Jamal Trio, MainArtist - Dave Usher, Producer Copyright : ℗ 1958 Verve Label Group, a Division of UMG Recordings, Inc.
Hugh Martin, ComposerLyricist - Ralph Blane, ComposerLyricist - Ahmad Jamal Trio, MainArtist - Dave Usher, Producer Copyright : ℗ 1958 Verve Label Group, a Division of UMG Recordings, Inc.
Harry Warren, Composer - Mack Gordon, Author - Ahmad Jamal Trio, MainArtist - Dave Usher, Producer Copyright : ℗ 1958 Verve Label Group, a Division of UMG Recordings, Inc.
Irving Berlin, ComposerLyricist - Ahmad Jamal Trio, MainArtist - Dave Usher, Producer Copyright : ℗ 1958 Verve Label Group, a Division of UMG Recordings, Inc.
Vernon Duke, ComposerLyricist - Ahmad Jamal Trio, MainArtist - Dave Usher, Producer Copyright : ℗ 1958 Verve Label Group, a Division of UMG Recordings, Inc.
Paul Francis Webster, Author - Sammy Fain, Composer - Ahmad Jamal Trio, MainArtist - Dave Usher, Producer Copyright : ℗ 1958 Verve Label Group, a Division of UMG Recordings, Inc.
JOHNNY HODGES, Composer - Ahmad Jamal Trio, MainArtist - Dave Usher, Producer Copyright : ℗ 1958 Verve Label Group, a Division of UMG Recordings, Inc.
ALAN BRANDT, Author - BOB HAYMES, Composer - Ahmad Jamal Trio, MainArtist - Dave Usher, Producer Copyright : ℗ 1958 Verve Label Group, a Division of UMG Recordings, Inc.
Richard Rodgers, ComposerLyricist - Lorenz Hart, ComposerLyricist - Ahmad Jamal, Piano, MainArtist, AssociatedPerformer - Israel Crosby, Double Bass, AssociatedPerformer - Vernel Fournier, Drums, AssociatedPerformer - Dave Usher, Producer Copyright : ℗ 1958 Verve Label Group, a Division of UMG Recordings, Inc.
Johnny Mercer, Author - Joseph Kosma, Composer - Ahmad Jamal, Piano, MainArtist, AssociatedPerformer - Israel Crosby, Double Bass, AssociatedPerformer - Vernel Fournier, Drums, AssociatedPerformer - Malcolm Chisholm, Recording Engineer, StudioPersonnel - Dave Usher, Producer Copyright : ℗ 1958 Verve Label Group, a Division of UMG Recordings, Inc.
Ahmad Jamal, Piano, MainArtist, AssociatedPerformer, ComposerLyricist - Israel Crosby, Double Bass, AssociatedPerformer - Vernel Fournier, Drums, AssociatedPerformer - Dave Usher, Producer Copyright : ℗ 1958 Verve Label Group, a Division of UMG Recordings, Inc.
E.Y. HARBURG, Author, ComposerLyricist - Burton Lane, Composer, ComposerLyricist - Ahmad Jamal, Piano, MainArtist, AssociatedPerformer - Israel Crosby, Double Bass, AssociatedPerformer - Vernel Fournier, Drums, AssociatedPerformer - Dave Usher, Producer Copyright : ℗ 1958 Verve Label Group, a Division of UMG Recordings, Inc.
Jamal, ComposerLyricist - Ahmad Jamal, Piano, MainArtist, AssociatedPerformer - Israel Crosby, Double Bass, AssociatedPerformer - Vernel Fournier, Drums, AssociatedPerformer - Dave Usher, Producer Copyright : ℗ 1958 Verve Label Group, a Division of UMG Recordings, Inc.
Johnny Burke, Author - Jimmy Van Heusen, Composer - Ahmad Jamal, Piano, MainArtist, AssociatedPerformer - Israel Crosby, Double Bass, AssociatedPerformer - Vernel Fournier, Drums, AssociatedPerformer - Dave Usher, Producer Copyright : ℗ 1958 Verve Label Group, a Division of UMG Recordings, Inc.
HOAGY CARMICHAEL, ComposerLyricist - Ahmad Jamal, Piano, MainArtist, AssociatedPerformer - Israel Crosby, Double Bass, AssociatedPerformer - Vernel Fournier, Drums, AssociatedPerformer - Malcolm Chisholm, Recording Engineer, StudioPersonnel - Dave Usher, Producer Copyright : ℗ 1958 Verve Label Group, a Division of UMG Recordings, Inc.
Ahmad Jamal, Piano, MainArtist, AssociatedPerformer - Israel Crosby, Double Bass, AssociatedPerformer - Irving Ashby, ComposerLyricist - Vernel Fournier, Drums, AssociatedPerformer - Malcolm Chisholm, Recording Engineer, StudioPersonnel - Dave Usher, Producer Copyright : ℗ 1958 Verve Label Group, a Division of UMG Recordings, Inc.
Harold Arlen, Composer - Ted Koehler, Author - Ahmad Jamal, Piano, MainArtist, AssociatedPerformer - Israel Crosby, Double Bass, AssociatedPerformer - Vernel Fournier, Drums, AssociatedPerformer - Dave Usher, Producer Copyright : ℗ 1958 Verve Label Group, a Division of UMG Recordings, Inc.
Gene DePaul, ComposerLyricist - Don Raye, ComposerLyricist - Ahmad Jamal, Piano, MainArtist, AssociatedPerformer - Israel Crosby, Double Bass, AssociatedPerformer - Vernel Fournier, Drums, AssociatedPerformer - Dave Usher, Producer Copyright : ℗ 1958 Verve Label Group, a Division of UMG Recordings, Inc.
Charles Henderson, ComposerLyricist - Pat Ballard, ComposerLyricist - Ahmad Jamal, Piano, MainArtist, AssociatedPerformer - Israel Crosby, Double Bass, AssociatedPerformer - Tom Waring, ComposerLyricist - Vernel Fournier, Drums, AssociatedPerformer - Dave Usher, Producer Copyright : ℗ 1958 Verve Label Group, a Division of UMG Recordings, Inc.
Leo Robin, Author - Arthur Schwartz, Composer - Ahmad Jamal, Piano, MainArtist, AssociatedPerformer - Israel Crosby, Double Bass, AssociatedPerformer - Vernel Fournier, Drums, AssociatedPerformer - Malcolm Chisholm, Recording Engineer, StudioPersonnel - Dave Usher, Producer Copyright : ℗ 1958 Verve Label Group, a Division of UMG Recordings, Inc.
Tadd Dameron, ComposerLyricist - Ahmad Jamal, Piano, MainArtist, AssociatedPerformer - Israel Crosby, Double Bass, AssociatedPerformer - Vernel Fournier, Drums, AssociatedPerformer - Dave Usher, Producer Copyright : ℗ 1958 Verve Label Group, a Division of UMG Recordings, Inc.
HOAGY CARMICHAEL, ComposerLyricist - Ahmad Jamal, Piano, MainArtist, AssociatedPerformer - Stanley Adams, ComposerLyricist - Israel Crosby, Double Bass, AssociatedPerformer - Vernell Fournier, Drums, AssociatedPerformer - Jack Tracy, Producer Copyright : ℗ 1960 Verve Label Group, a Division of UMG Recordings, Inc.
Sam M. Lewis, ComposerLyricist - J. Fred Coots, ComposerLyricist - Ahmad Jamal, Piano, MainArtist, AssociatedPerformer - Israel Crosby, Double Bass, AssociatedPerformer - Vernell Fournier, Drums, AssociatedPerformer - Jack Tracy, Producer Copyright : ℗ 1960 Verve Label Group, a Division of UMG Recordings, Inc.
Ahmad Jamal, Piano, MainArtist, AssociatedPerformer - Morton GOULD, ComposerLyricist - Israel Crosby, Double Bass, AssociatedPerformer - Vernell Fournier, Drums, AssociatedPerformer - Jack Tracy, Producer - Gillies Shelly, ComposerLyricist Copyright : ℗ 1960 Verve Label Group, a Division of UMG Recordings, Inc.
Ahmad Jamal, Piano, MainArtist, AssociatedPerformer, ComposerLyricist - Israel Crosby, Double Bass, AssociatedPerformer - Vernell Fournier, Drums, AssociatedPerformer - Jack Tracy, Producer Copyright : ℗ 1960 Verve Label Group, a Division of UMG Recordings, Inc.
Cole Porter, ComposerLyricist - Ahmad Jamal, Piano, MainArtist, AssociatedPerformer - Israel Crosby, Double Bass, AssociatedPerformer - Vernell Fournier, Drums, AssociatedPerformer - Jack Tracy, Producer Copyright : ℗ 1960 Verve Label Group, a Division of UMG Recordings, Inc.
Vincent Youmans, Composer - Mack Gordon, Author - Harold Adamson, Author - Ahmad Jamal, Piano, MainArtist, AssociatedPerformer - Israel Crosby, Double Bass, AssociatedPerformer - Vernell Fournier, Drums, AssociatedPerformer - Jack Tracy, Producer - Leonard Chess, Producer Copyright : ℗ 1960 Verve Label Group, a Division of UMG Recordings, Inc.
Billy Strayhorn, ComposerLyricist - Ahmad Jamal, Piano, MainArtist, AssociatedPerformer - Israel Crosby, Double Bass, AssociatedPerformer - Vernell Fournier, Drums, AssociatedPerformer - Jack Tracy, Producer Copyright : ℗ 1960 Verve Label Group, a Division of UMG Recordings, Inc.
Sammy Cahn, ComposerLyricist - Ahmad Jamal, Piano, MainArtist, AssociatedPerformer - Israel Crosby, Double Bass, AssociatedPerformer - Vernell Fournier, Drums, AssociatedPerformer - Jack Tracy, Producer Copyright : ℗ 1960 Verve Label Group, a Division of UMG Recordings, Inc.
Kurt Weill, Composer - Ogden Nash, Author - Ahmad Jamal, Piano, MainArtist, AssociatedPerformer - Israel Crosby, Double Bass, AssociatedPerformer - Vernell Fournier, Drums, AssociatedPerformer - Jack Tracy, Producer Copyright : ℗ 1960 Verve Label Group, a Division of UMG Recordings, Inc.
Bruno Coquatrix, ComposerLyricist - Ahmad Jamal, MainArtist - Joe Kennedy, Conductor, Recording Arranger, AssociatedPerformer - Dave Usher, Producer Copyright : ℗ 1959 Verve Label Group, a Division of UMG Recordings, Inc.
HOAGY CARMICHAEL, ComposerLyricist - Ahmad Jamal, MainArtist - Joe Kennedy, Conductor, Recording Arranger, AssociatedPerformer - Dave Usher, Producer Copyright : ℗ 1959 Verve Label Group, a Division of UMG Recordings, Inc.
Jule Styne, ComposerLyricist - Ahmad Jamal, MainArtist - Joe Kennedy, Conductor, Recording Arranger, AssociatedPerformer - Dave Usher, Producer Copyright : ℗ 1959 Verve Label Group, a Division of UMG Recordings, Inc.
Johnny Mercer, ComposerLyricist - Ahmad Jamal, MainArtist - Joe Kennedy, Conductor, Recording Arranger, AssociatedPerformer - Dave Usher, Producer Copyright : ℗ 1959 Verve Label Group, a Division of UMG Recordings, Inc.
Ahmad Jamal, MainArtist, ComposerLyricist - Joe Kennedy, Conductor, Recording Arranger, AssociatedPerformer - Dave Usher, Producer Copyright : ℗ 1959 Verve Label Group, a Division of UMG Recordings, Inc.
Richard Rodgers, ComposerLyricist - Ahmad Jamal, MainArtist - Joe Kennedy, Conductor, Recording Arranger, AssociatedPerformer - Dave Usher, Producer Copyright : ℗ 1959 Verve Label Group, a Division of UMG Recordings, Inc.
Ahmad Jamal, MainArtist - Joe Kennedy, Conductor, Recording Arranger, AssociatedPerformer - Lewis Estes, ComposerLyricist - Dave Usher, Producer Copyright : ℗ 1959 Verve Label Group, a Division of UMG Recordings, Inc.
J. Kennedy, ComposerLyricist - Ahmad Jamal, MainArtist - Joe Kennedy, Conductor, Recording Arranger, AssociatedPerformer - Dave Usher, Producer Copyright : ℗ 1959 Verve Label Group, a Division of UMG Recordings, Inc.
Ahmad Jamal, Piano, AssociatedPerformer - Israel Crosby, Double Bass, AssociatedPerformer - Ray Crawford, Guitar, AssociatedPerformer - Jack Tracy, Producer - Joe Kennedy, Recording Arranger, AssociatedPerformer - Ahmad Jamal Quintet, MainArtist - Vernel Fournier, Drums, AssociatedPerformer - Joe Kennedy Jr., ComposerLyricist Copyright : ℗ 1961 Verve Label Group, a Division of UMG Recordings, Inc.
Ahmad Jamal, Piano, AssociatedPerformer - Israel Crosby, Double Bass, AssociatedPerformer - Ray Crawford, Guitar, AssociatedPerformer - Jack Tracy, Producer - Joe Kennedy, Recording Arranger, AssociatedPerformer - Christine Reynolds, ComposerLyricist - Ahmad Jamal Quintet, MainArtist - Vernel Fournier, Drums, AssociatedPerformer Copyright : ℗ 1961 Verve Label Group, a Division of UMG Recordings, Inc.
Jerome Kern, ComposerLyricist - Ahmad Jamal, Piano, AssociatedPerformer - Israel Crosby, Double Bass, AssociatedPerformer - Ray Crawford, Guitar, AssociatedPerformer - Jack Tracy, Producer - Joe Kennedy, Recording Arranger, AssociatedPerformer - O.Harbach, ComposerLyricist - Ahmad Jamal Quintet, MainArtist - Vernel Fournier, Drums, AssociatedPerformer Copyright : ℗ 1961 Verve Label Group, a Division of UMG Recordings, Inc.
Clifford Grey, ComposerLyricist - Ahmad Jamal, Piano, AssociatedPerformer - Israel Crosby, Double Bass, AssociatedPerformer - Ray Crawford, Guitar, AssociatedPerformer - Jack Tracy, Producer - Joe Kennedy, Recording Arranger, AssociatedPerformer - Ahmad Jamal Quintet, MainArtist - Vernel Fournier, Drums, AssociatedPerformer Copyright : ℗ 1961 Verve Label Group, a Division of UMG Recordings, Inc.
Harold Adamson, ComposerLyricist - JAN SAVITT, ComposerLyricist - Ahmad Jamal, Piano, AssociatedPerformer - Israel Crosby, Double Bass, AssociatedPerformer - Ray Crawford, Guitar, AssociatedPerformer - Jack Tracy, Producer - Joe Kennedy, Recording Arranger, AssociatedPerformer - Ahmad Jamal Quintet, MainArtist - Vernel Fournier, Drums, AssociatedPerformer Copyright : ℗ 1961 Verve Label Group, a Division of UMG Recordings, Inc.
Ary Barroso, ComposerLyricist - Ahmad Jamal, Piano, AssociatedPerformer - Israel Crosby, Double Bass, AssociatedPerformer - Ray Crawford, Guitar, AssociatedPerformer - Jack Tracy, Producer - Joe Kennedy, Recording Arranger, AssociatedPerformer - Ahmad Jamal Quintet, MainArtist - Vernel Fournier, Drums, AssociatedPerformer Copyright : ℗ 1961 Verve Label Group, a Division of UMG Recordings, Inc.
Ahmad Jamal, Piano, AssociatedPerformer - Israel Crosby, Double Bass, AssociatedPerformer - Ray Crawford, Guitar, AssociatedPerformer - Jack Tracy, Producer - Joe Kennedy, Recording Arranger, AssociatedPerformer - S.K. "Bob" Russell, ComposerLyricist - Ahmad Jamal Quintet, MainArtist - Vernel Fournier, Drums, AssociatedPerformer Copyright : ℗ 1961 Verve Label Group, a Division of UMG Recordings, Inc.
Jimmie Davis, ComposerLyricist - Ahmad Jamal, Piano, AssociatedPerformer - Jimmy Sherman, ComposerLyricist - Israel Crosby, Double Bass, AssociatedPerformer - Ray Crawford, Guitar, AssociatedPerformer - Jack Tracy, Producer - Joe Kennedy, Recording Arranger, AssociatedPerformer - Ahmad Jamal Quintet, MainArtist - Vernel Fournier, Drums, AssociatedPerformer Copyright : ℗ 1961 Verve Label Group, a Division of UMG Recordings, Inc.
George Gershwin, ComposerLyricist - Ira Gershwin, ComposerLyricist - Ahmad Jamal, Piano, AssociatedPerformer - Israel Crosby, Double Bass, AssociatedPerformer - Ray Crawford, Guitar, AssociatedPerformer - Jack Tracy, Producer - Joe Kennedy, Recording Arranger, AssociatedPerformer - Ahmad Jamal Quintet, MainArtist - Vernel Fournier, Drums, AssociatedPerformer Copyright : ℗ 1961 Verve Label Group, a Division of UMG Recordings, Inc.
Richard Rodgers, ComposerLyricist - Oscar Hammerstein II , ComposerLyricist - Ahmad Jamal, MainArtist - Leonard Chess, Producer Copyright : ℗ 1961 The Verve Music Group, a Division of UMG Recordings, Inc.
Jules Lemare, ComposerLyricist - Gus Arnheim, ComposerLyricist - Harry Tobias, Author - Ahmad Jamal, MainArtist - Leonard Chess, Producer Copyright : ℗ 1961 Verve Label Group, a Division of UMG Recordings, Inc.
Jule Styne, Composer - Adolph Green, Author - Betty Comden, Author - Ahmad Jamal, MainArtist - Leonard Chess, Producer Copyright : ℗ 1961 Verve Label Group, a Division of UMG Recordings, Inc.
Cole Porter, ComposerLyricist - Ahmad Jamal, MainArtist - Leonard Chess, Producer Copyright : ℗ 1961 Verve Label Group, a Division of UMG Recordings, Inc.
Ahmad Jamal, MainArtist - Claude Thornhill, ComposerLyricist - Leonard Chess, Producer Copyright : ℗ 1961 Verve Label Group, a Division of UMG Recordings, Inc.
Bill Byrd, ComposerLyricist - Teddy McRae, ComposerLyricist - Henri Woode, ComposerLyricist - Ahmad Jamal, MainArtist - Leonard Chess, Producer Copyright : ℗ 1961 The Verve Music Group, a Division of UMG Recordings, Inc.
Ann Ronell, Composer - Ahmad Jamal, MainArtist - Leonard Chess, Producer Copyright : ℗ 1961 Verve Label Group, a Division of UMG Recordings, Inc.
Johnny Mercer, Author - Joseph Kosma, Composer - Ahmad Jamal, MainArtist - Leonard Chess, Producer Copyright : ℗ 1961 Verve Label Group, a Division of UMG Recordings, Inc.
Richard Rodgers, Composer - Lorenz Hart, Author - Ahmad Jamal, MainArtist - Leonard Chess, Producer Copyright : ℗ 1961 Verve Label Group, a Division of UMG Recordings, Inc.
Al Stillman, ComposerLyricist - Ernesto Lecuona, ComposerLyricist - Ahmad Jamal, MainArtist - Leonard Chess, Producer Copyright : ℗ 1961 Verve Label Group, a Division of UMG Recordings, Inc.
Vincent Youmans, Composer - Mack Gordon, Author - Harold Adamson, Author - Ahmad Jamal, Piano, MainArtist, AssociatedPerformer - Israel Crosby, Double Bass, AssociatedPerformer - Vernell Fournier, Drums, AssociatedPerformer - Leonard Chess, Producer Copyright : ℗ 1961 Verve Label Group, a Division of UMG Recordings, Inc.
Matt Dennis, Composer - Ahmad Jamal, Piano, MainArtist, AssociatedPerformer - Israel Crosby, Double Bass, AssociatedPerformer - Earl K. Brent, Author - Vernell Fournier, Drums, AssociatedPerformer - Leonard Chess, Producer Copyright : ℗ 1961 Verve Label Group, a Division of UMG Recordings, Inc.
J. Fred Coots, ComposerLyricist - Ahmad Jamal, Piano, MainArtist, AssociatedPerformer - Israel Crosby, Double Bass, AssociatedPerformer - Heaven Gillespie, ComposerLyricist - Vernell Fournier, Drums, AssociatedPerformer - Leonard Chess, Producer Copyright : ℗ 1961 Verve Label Group, a Division of UMG Recordings, Inc.
Gene DePaul, ComposerLyricist - Don Raye, ComposerLyricist - Ahmad Jamal, Piano, MainArtist, AssociatedPerformer - Israel Crosby, Double Bass, AssociatedPerformer - Vernell Fournier, Drums, AssociatedPerformer - Leonard Chess, Producer Copyright : ℗ 1961 Verve Label Group, a Division of UMG Recordings, Inc.
Cole Porter, ComposerLyricist - Ahmad Jamal, Piano, MainArtist, AssociatedPerformer - Israel Crosby, Double Bass, AssociatedPerformer - Ray Crawford, Guitar, AssociatedPerformer - Vernell Fournier, Drums, AssociatedPerformer - Leonard Chess, Producer Copyright : ℗ 1961 Verve Label Group, a Division of UMG Recordings, Inc.
Ahmad Jamal, Piano, MainArtist, AssociatedPerformer - Israel Crosby, Double Bass, AssociatedPerformer - Vernell Fournier, Drums, AssociatedPerformer - Ord Hamilton, ComposerLyricist - Leonard Chess, Producer Copyright : ℗ 1961 Verve Label Group, a Division of UMG Recordings, Inc.
Cole Porter, ComposerLyricist - Ahmad Jamal, Piano, MainArtist, AssociatedPerformer - Israel Crosby, Double Bass, AssociatedPerformer - Vernell Fournier, Drums, AssociatedPerformer - Leonard Chess, Producer Copyright : ℗ 1961 Verve Label Group, a Division of UMG Recordings, Inc.
Richard Rodgers, ComposerLyricist - Lorenz Hart, ComposerLyricist - Oscar Hammerstein II , ComposerLyricist - Ben Oakland, Composer - Ahmad Jamal, Piano, MainArtist, AssociatedPerformer - Israel Crosby, Double Bass, AssociatedPerformer - Paul Gayten, Producer - Vernell Fournier, Drums, AssociatedPerformer Copyright : ℗ 1961 Verve Label Group, a Division of UMG Recordings, Inc.
Johnny Burke, ComposerLyricist - Jimmy Van Heusen, ComposerLyricist - Ahmad Jamal, Piano, MainArtist, AssociatedPerformer - Israel Crosby, Double Bass, AssociatedPerformer - Paul Gayten, Producer - Vernell Fournier, Drums, AssociatedPerformer Copyright : ℗ 1962 Verve Label Group, a Division of UMG Recordings, Inc.
Richard Rodgers, ComposerLyricist - Lorenz Hart, ComposerLyricist - Ahmad Jamal, Piano, MainArtist, AssociatedPerformer - Israel Crosby, Double Bass, AssociatedPerformer - Paul Gayten, Producer - Vernell Fournier, Drums, AssociatedPerformer Copyright : ℗ 1961 Verve Label Group, a Division of UMG Recordings, Inc.
Irving Berlin, ComposerLyricist - Ahmad Jamal, Piano, MainArtist, AssociatedPerformer - Israel Crosby, Double Bass, AssociatedPerformer - Paul Gayten, Producer - Vernell Fournier, Drums, AssociatedPerformer Copyright : ℗ 1961 Verve Label Group, a Division of UMG Recordings, Inc.
E.Y. HARBURG, Composer - Vernon Duke, Author - Ahmad Jamal, Piano, MainArtist, AssociatedPerformer - Israel Crosby, Double Bass, AssociatedPerformer - Paul Gayten, Producer - Vernell Fournier, Drums, AssociatedPerformer Copyright : ℗ 1961 Verve Label Group, a Division of UMG Recordings, Inc.
Sammy Cahn, Author - Jimmy Van Heusen, Composer - Ahmad Jamal, Piano, MainArtist, AssociatedPerformer - Israel Crosby, Double Bass, AssociatedPerformer - Paul Gayten, Producer - Vernell Fournier, Drums, AssociatedPerformer Copyright : ℗ 1961 Verve Label Group, a Division of UMG Recordings, Inc.
FRED ROSE, ComposerLyricist - Ahmad Jamal, Piano, MainArtist, AssociatedPerformer - Israel Crosby, Double Bass, AssociatedPerformer - Paul Gayten, Producer - Vernell Fournier, Drums, AssociatedPerformer Copyright : ℗ 1962 Verve Label Group, a Division of UMG Recordings, Inc.
Jamal, Composer - Ahmad Jamal, Piano, MainArtist, AssociatedPerformer, ComposerLyricist - Israel Crosby, Double Bass, AssociatedPerformer - Paul Gayten, Producer - Vernell Fournier, Drums, AssociatedPerformer Copyright : ℗ 1962 Verve Label Group, a Division of UMG Recordings, Inc.
Jimmy Van Heusen, ComposerLyricist - Eddie Delange, ComposerLyricist - Ahmad Jamal, Participant - Israel Crosby, Participant - Paul Gayten, Producer - Ahmad Jamal Trio, MainArtist - Vernell Fournier, Participant Copyright : ℗ 1961 UMG Recordings, Inc.
© © 2010 UMG Recordings, Inc.
A Verve Label Group release; This Compilation ℗ 2010 UMG Recordings, Inc.